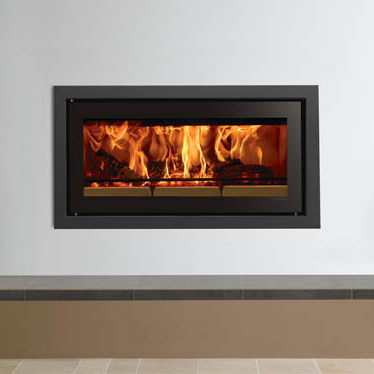 The Stovax Riva Studio collection are a sleek, contemporary wood burning cassette that can easily be installed into standard chimney breasts. The Riva studio range is complemented by a large collection of optional frames which are designed to suit every taste and design choice. All Riva Studios are available in three sizes: Studio 1, 2 and 3. 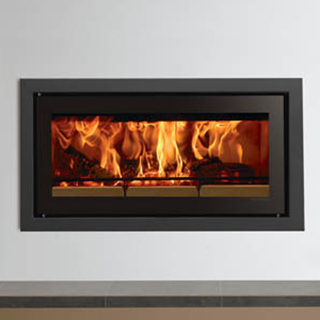 The smaller Studio 1 fire offers up to 5kW heat output while the largest, Studio 3, will produce up to 11kW heat for larger rooms. With the addition of the clever optional ducting system heat can also be transferred to other rooms, making the studio range a truly versatile wood heating appliance. Studio 1 and 2 are available with the optional kit for use in smoke control areas. 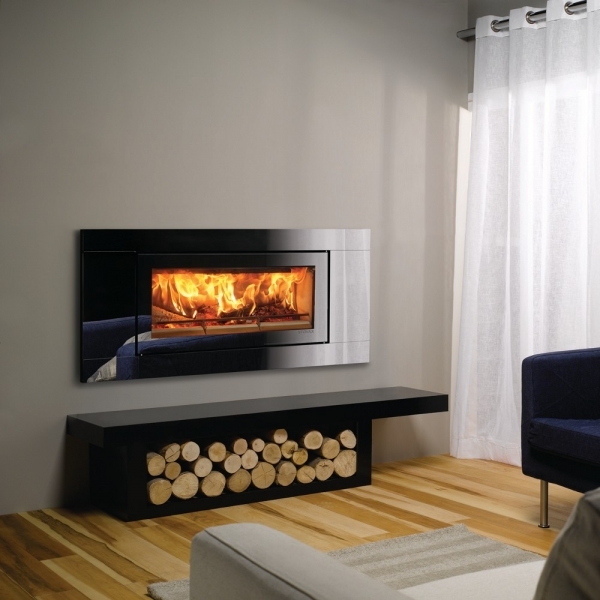 This range of stoves is distributed in UK and Ireland by the Stovax Stove Group. As an authorised dealer Bowland Stoves can offer a five year guarantee on all Stovax Stoves. The Stovax Heating Group Ltd take great care to ensure its products are designed and manufactured to the highest possible quality and safety standards, and it is vital that they are sold and installed correctly. The Stovax Heating Group recommend that a pre-sire survey is carried out prior to purchase to ensure that your chosen appliance will be installed to all local and national regulations. For this reason, the Stovax Heating Group strongly encourage you to visit one off its qualified independent retailers who will be able to provide you with the best support both before and after making your purchase. Your Retailer will be responsible for ensuring that the installation complies with relevant Building Regulations and the rules in force, and is carried out by a suitably trained and qualified individual (HETAS registered or Gas Safe registered in the United Kingdom or equivalent in other countries) with a certificate of installation and the appropriate commissioning report completed and retained by the end-user. These can be found within your installation and User Manual. Statutory rights under the Consumers Rights Act 2015 as a purchaser of products manufactured by the Stovax Heating Group are primarily against the retailer. Traditional methods of purchase may provide more direct/additional means of communication such rights. Please be aware that the Stovax Heating Group do not offer technical support to products bought via nationwide online sales, where a Stovax Heating Group qualified independent retailer would otherwise offer this support. Flue Dia: 150mm / 6"
Delivery times for stoves and spare parts will vary depending on whether they are in stock, readily available from the manufacturer or, in some cases, have longer than normal lead times. Please note there are no weekend deliveries - Monday to Friday only. Please ensure ALL of your contact details are correct and we have phone numbers that we can contact you on. You will automatically be notified of a delivery date, or if you prefer, you can change this date to one that suits you better. Where possible all orders received will be despatched the following working day, on a next day service, with the exception of orders received on Thursday and Friday. These will be despatched on Monday. The driver is obliged to wait with you for up to 15 mins while you unpack the goods and check them. If the driver refuses to wait please mark the delivery note as "unchecked". If your goods are damaged please contact our Customer Service Team within 24 hours, quoting your Order Reference and Delivery Note Number, and we will ensure your query will be dealt with efficiently. While we do our utmost to ensure your goods are delivered on the agreed date at the agreed time, this is in the hands of third-party couriers over whom we have no direct control.